Portland is a huge city for Mixed Martial Arts, with Team Quest in town, some of the best world class fighters fight out of Portland. One of those great fighters Chael Sonnen, gives back to the Mixed Martial Arts community in Portland by putting on Rumble at The Roseland (along with Kevin Keeney). This regular showcase of up and coming fighters gives local fighters a chance to start their careers and make a run at professional careers in MMA. Tonight’s rumble proves to be an exciting night of fights with two significant title bouts: Kress Matijacic vs. Crae Basset and Tom Matijacic vs. Pro Escobedo, the second of which matches up two undefeated fighters. Perhaps the most compelling story of tonight is the debut of Jake Morris, a highly ranked state wrestler…in high school at Oregon City. 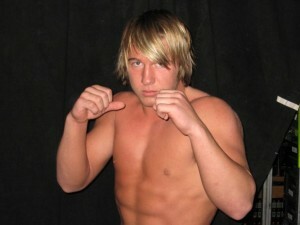 Morris turned eighteen just three days ago and has his MMA debut at Rumble at the Roseland. Morris a two time state collegiate wrestling champion is planning to show off his stand up game in his MMA debut, “I want to keep the fight on my feet as much as I can, I have the wrestling background but I only want to use that if I have to. I want to make a show on my feet, see what I can do.” Morris will take on Brandon Alderman who is 23 and is also making his MMA debut. Rumble at the Roseland 40 starts tonight (12/6) at the Roseland Theater (8 NW Sixth Ave). Doors open at 6pm and Fights start at 7. The Rumble is offten packed to capacity, often with standing room only for latecomers. On Portland plans to twitter live from tonight’s Rumble at the Roseland. Follow us on Twitter.